The Art Department of the Free Library of Philadelphia maintains a collection of artist files going back to the 19th century. 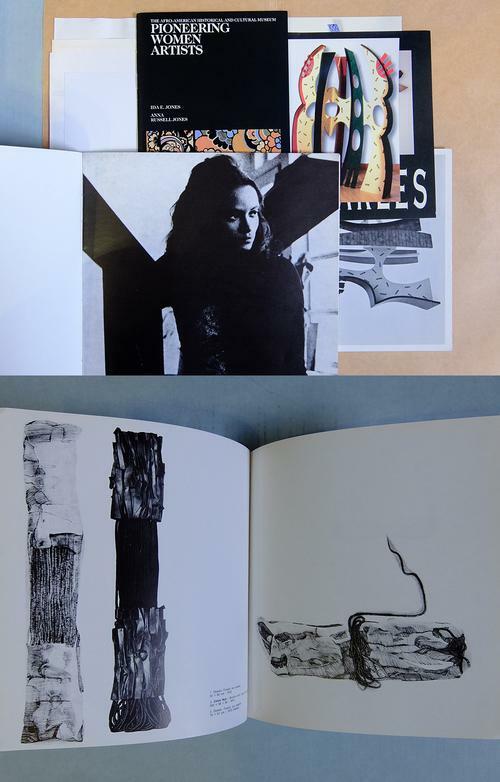 Our artist files are folders that include article clippings, gallery announcements, artist statements, exhibition catalogs, and other ephemera related to artists and art subjects with a focus on the Philadelphia area. Printed materials like these are called ephemera because they were initially produced in order to quickly convey information and are often discarded. In celebration of Black History Month, we've assembled a display of material drawn entirely from these vertical files. It documents some of the activities of African American artists: painters, sculptors, printmakers, designers, photographers, illustrators and architects, all active in the Philadelphia area. 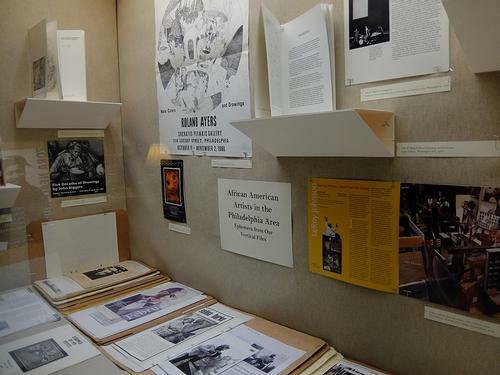 African American Artists in the Philadelphia Area: Ephemera from Our Vertical Files can be viewed now through Sunday, March 26 in the Art Department at Parkway Central Library. These particular files were assembled and augmented for decades by librarians of the Art Department with the aid and advice of local art critics and the artist community. By no means exhaustive in their scope and contents, they nevertheless serve as a good starting point for researchers investigating a particular locally active artist. In some cases, our files offer rich documentation on individual artists that have yet to gain more of the public recognition they deserve. And in many other cases, the folders contain the only substantial information on a given artist to be found among our resources and information that is awaiting its researchers. The design of our Parkway Central Library is one of hundreds attributed to prominent architect Julian Francis Abele. The following online exhibition provides context and our digital collections contain just a few examples of the material related to Abele’s work. The Pyramid Club was a Philadelphia social club founded in 1937 that played a major role in exhibiting local African American artists. The following catalogs provide some information about the club and its long-time art director, the painter Humbert Howard. Philadelphia painter Barbara Bullock is discussed in depth in the Winter 2016 issue of The International Review of African American Art (v. 26 n. 4), one of the many current periodicals that can be found in the Art Department. Barbara Chase-Riboud is a major visual artist and sculptor, as well as a well-known novelist and poet. The work of Allan Edmunds is featured alongside that of many artists in these books about the Brandywine Workshop, the Philadelphia printmaking school and studio that he founded. Photographer John W. Mosley closely documented all aspects of life in Philadelphia’s African American community from the 1930s to the 1980s. Howardena Pindell and Charles Searles are both Philadelphia natives whose art-making employs a variety of mediums. West Chester artist Horace Pippin has many titles devoted to his legacy, for readers of all ages, as does the celebrated turn of the twentieth-century painter Henry Ossawa Tanner. Speaking of readers of all ages, the library holds a very large number of titles that bear the artwork of Philadelphia children’s book author and illustrator Jerry Pinkney. The murals created for the Church of the Advocate in Philadelphia by Walter Edmonds and Richard Watson are featured in The Peoples' Art: Black Murals, 1967-1978, the catalog of the 1986 exhibition at the African American Historical and Cultural Museum. Pioneering printmaker Dox Thrash is best remembered for his Philadelphia work with the Federal Art Project of the Works Progress Administration. The Free Library’s Print and Picture Collection holds many original works by artists employed by federal work relief programs of the 1930s, including Samuel J. Brown, Raymond Steth, and Dox Thrash as well as other material related to those artists, such as this photograph. The prints in the Works Progress Administration collection reproduced in our digital collections represent just a sample of the whole. In addition to artists associated with its WPA collection, the Print and Picture Collection holds original artwork by several other local African American artists, which may be examined by contacting the curator in advance to arrange a research appointment. The two catalogs, First in the Heart is the Dream: African-American Artists in the 20th Century, the Philadelphia Connection, from the 1992 exhibition mounted by the Philadelphia Art Alliance and the excellent 2015 show at the Woodmere Art Museum, We Speak: Black Artists in Philadelphia, 1920s-1970s will be very helpful to those seeking to learn more about many of the artists listed above. Information on some of those names may also be found by searching our art databases. 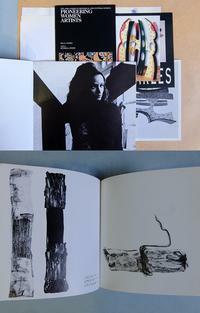 In addition to entries on individual artists, the vertical files in the Art Department also contain folders on local subjects such as institutions, galleries and art programs. Some subject folder titles that may be of interest to those researching the activities of local African American artists are the African American Museum in Philadelphia (formerly the African American Historical and Cultural Museum), the Brandywine Workshop, Ile-Ife Black Humanitarian Center, the Pyramid Club, Recherché and the Sande Webster Gallery. 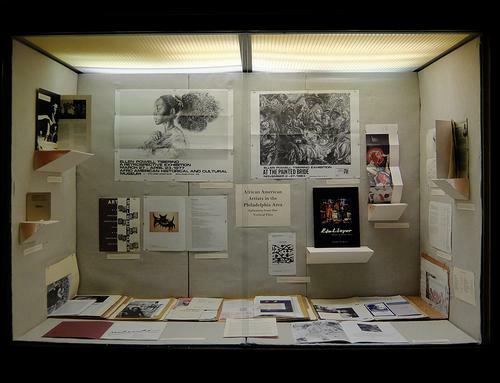 Researchers may ask to see any of these folders after this display is dismounted on March 26, by inquiring at the Art Department reference desk. Display case in Art Department for "African American Artists in the Philadelphia Area: Ephemera from Our Vertical Files" exhibit.